One-handed and hands-free iPad holders for tables, walkers, recliners, etc. These workshops are open to service providers, caregivers, family members and end users who experience difficulty or the inability to move their upper or lower extremities due to paralyzing conditions such as, Stroke, Alzheimer’s Disease, Brain Injury, Multiple Sclerosis, ALS, and Spinal Cord Injury. These workshops are only targeting individuals who reside in rural cities and towns as defined by the US. Census report, therefore individuals who reside in Manchester or Nashua are not eligible to participate. Therese Willkomm, Ph.D., ATP, directs the NH Statewide Assistive Technology (ATinNH) program with the Institute on Disability and is a clinical associate professor in the University of New Hampshire Department of Occupational Therapy. 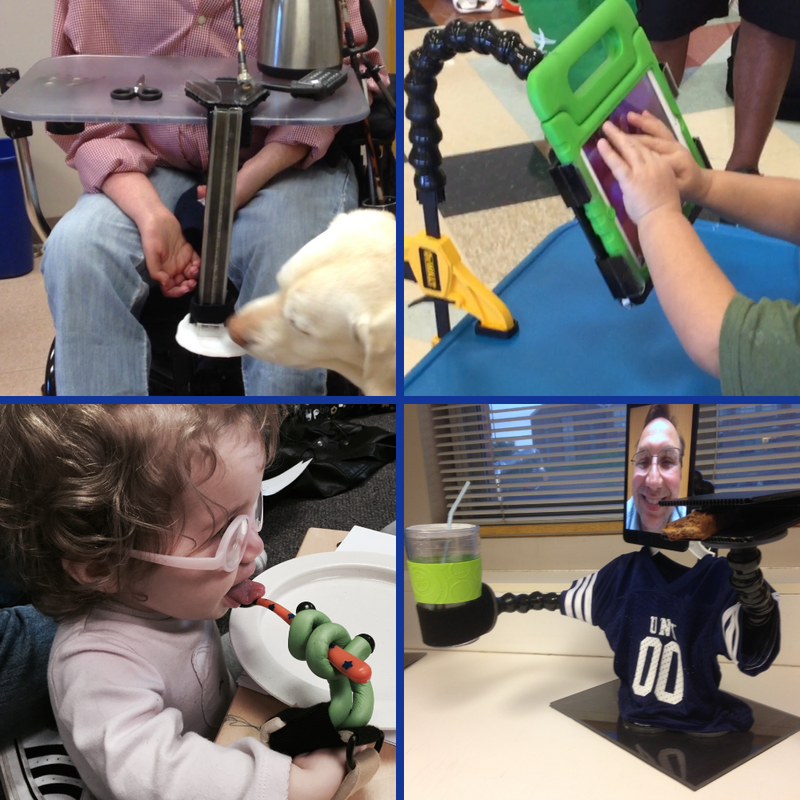 Known internationally as “The MacGyver of Assistive Technology” and more recently as an expert in iPad modifications and apps for individuals with disabilities, Dr. Willkomm has provided AT services for over 30 years. During that time, she has designed and fabricated over 1,200 solutions for individuals with disabilities including her patented A.T. Pad Stand, a multi-use assistive technology mounting device to provide hands-free holding solutions for individuals who experience paralysis. She has appeared on RFD TV, CNN, NPR Science Friday and has received numerous honors and awards including being invited to speak at the 2016 White House Summit on Technology and Disability. Stacy Driscoll, M.Ed, ATP is an Assistive Technology Specialist with the Assistive Technology in New Hampshire (ATinNH) program. She holds a graduate certificate in Assistive Technology and a master’s degree in Education. She has provided services to individuals with disabilities for over 25 years and conducts over 50 assistive technology workshops each year statewide and nationally. All workshops are free, and lunch will be on your own.